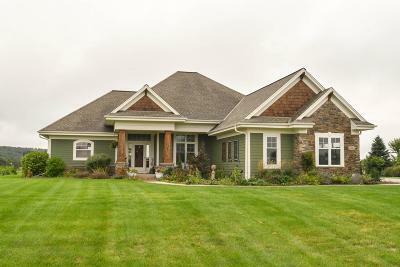 This custom built ranch home in Stonebrook Hollow has amazing views. The open concept floor plan offers expansive 12 ft tall ceilings & a chef's dream kitchen w/ Quartz Counter Tops, custom hand-glazed antique white cabinetry w/ exquisite leaded artisan glass in cabinets, pantry door, FR built-ins & office windows. SS Appliances, WIP & Dinette. Amazing family room w/ GFP designed by the artisans of Motawi Tileworks & Built in Cabinetry. Walk through the double doors to your Master Suite w/ WIC & Full Bath including a soaking tub, tile shower & double sinks. The main floor also has an office, mud room and laundry room. The Jack & Jill bath connects the 2nd & 3rd Bedroom w/ outstanding subway tile. HWF through out home. Enjoy entertaining in the LL w/hand-painted barn wood bar area & FR.